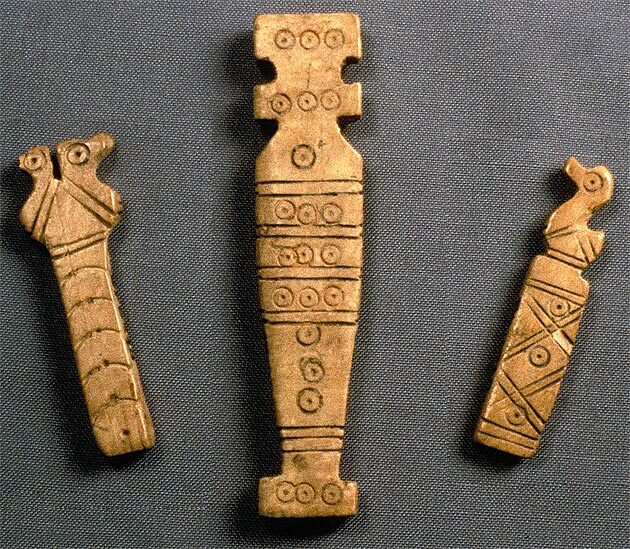 "Bone and ivory counters with circles and lines, carved in ways that do not correspond to dice, may have been used for predicting the future," writes Mark Kenoyer about these objects in Ancient Cities of the Indus Valley Civilization (p. 120). The counter on the right has a duck ornament at one end, the counter on the left has a double duck ornament on the end. The larger one may be a stylized figurine with triple circle motifs incised on both faces. What do you think these objects were used for?